Those of us who were enjoying the music of the 80s will get the cultural reference no doubt, but the following ramblings have little else to do with Le Bon and his mumbo-jumbo riddled verses. You see, the lamp-posts in my area (and every other area in Northern Ireland) have been "decorated" with the faces of wannabe politicians once more as we approach polling day for the Northern Ireland Assembly. To be honest, I'm really unsure if the Assembly has achieved anything positive over the years. I've seen some very strange decisions being made; lots of procrastination; plenty of finger-pointing; an unhealthy dose of border-line corruption and a dollop of disrespect to "yoghurts". It's difficult to respect many of the people who end up at Stormont and for the vast majority of those that do, they must be so proud that they have only managed to get there based on the flag they plaster behind their profile pictures on the posters that adorn our lamp-posts. They certainly don't get there based on anything they have achieved or anything they promise to do. 14 candidates will be standing in the South Antrim constituency but for those that have managed to abandon tribal voting, the choices are much more limited. 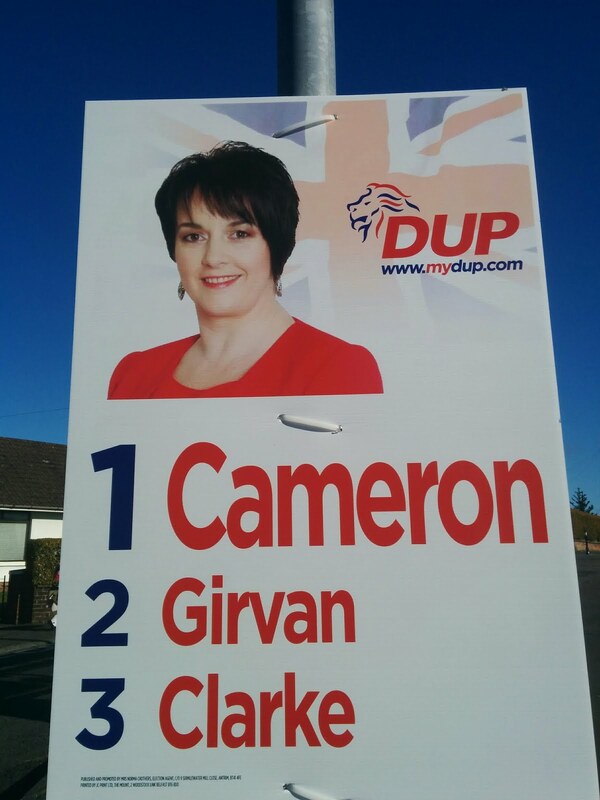 The Democratic Unionist Party is fielding 3 candidates, as seems to be the norm for them in this constituency. The fundamental problem I have with the D.U.P., however, is that they aren't terribly democratic! Their use of the "Petition Of Concern" in recent Marriage Equality votes is really only of concern to a tiny proportion of the population if opinion polls are anything to go by. My view is that a politician has only one responsibility and that is to provide an environment that doesn't discriminate and provides and equal playing field for all citizens in order to allow them to be the very best that they can be. If a party actively prevents a group of people from being treated the same as others, then they don't deserve my vote (and I would argue that they don't deserve ANYONE's vote). The real nail in the coffin for these guys, though, is that they are pleading for your vote! 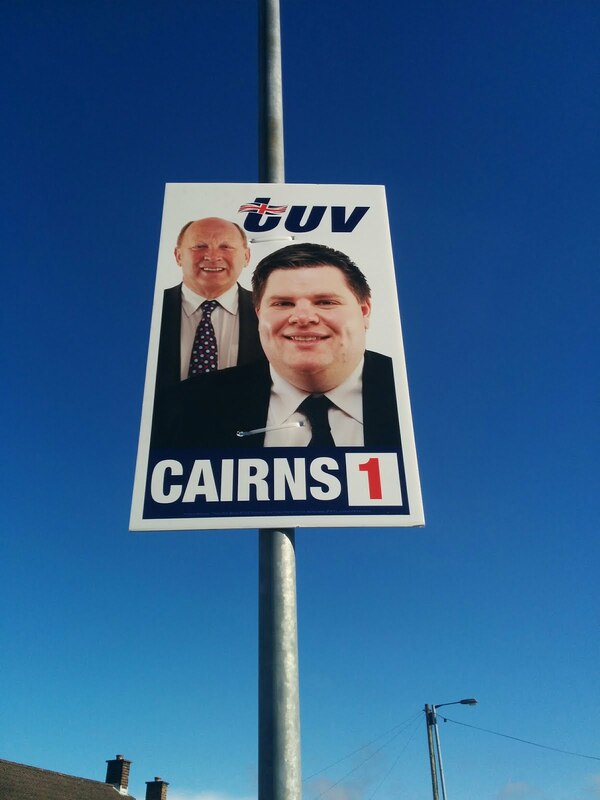 "Vote for us, else that evil wrongdoer McGuinness will become First Minister". Honestly, I'd rather vote for a candidate who is going to work for me and everyone else around me. NOTE: This bunch have a flag plastered everywhere to remind you of which tribe they belong to - though how anyone couldn't know is a mystery. 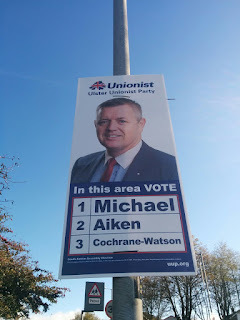 The Ulster Unionist Party is also fielding 3 candidates. How they have found 3 candidates is a mystery to me as the party seems to have become an irrelevance in a very short period of time. Their posters aren't as "shiny" as the D.U.P. 's posters (and must be about half the size); their flyers aren't as glossy (and must be about half the size); their profile pictures are just a little less slick (as they must be using low-resolution smart-phones for the photographs). When you read the blurb on their flyers, however, I can't help feel a little disappointed. 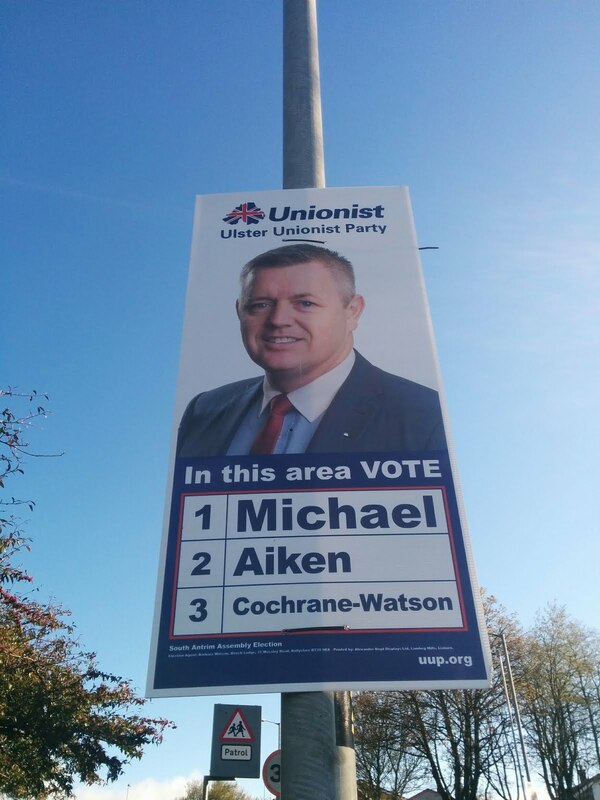 They also plead for the voter to "maximise the Unionist vote by voting 1-2-3 for the UUP". NOTE: This bunch have a flag plastered everywhere to remind you of which tribe they belong to too. It's a little less "in your face" than the D.U.P., of course. That's because the U.U.P. promote themselves as the reasonable side of unionism. Richard Cairns is the T.U.V. representative and I don't know the fella at all. But his poster scares me! Why? Well, look at it! Who is that weird looking guy lurking behind Richard who is doing his utmost to block him out, to be fair? Why it is Jim Allister, of course! For me, any party that feels the need to put its party leader on every poster is obviously being led by a megalomaniac. 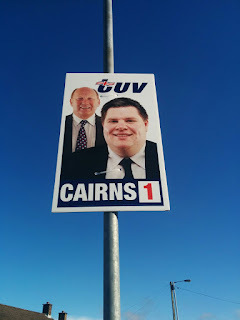 Their literature informs me that I should "VOTE 1 CAIRNS" with further preferences to other Unionist candidates. Strange given that the literature also tells me what a terrible job the D.U.P. are doing by keeping Sinn Fein in power and in particular, keeping the "IRA godfather, Martin McGuinness, Joint First Minister". That, to me, sounds like the politics of fear rather than the politics of hope. NOTE: This bunch have a flag plastered everywhere to remind you of which tribe they belong to too. We have a splash of purple these days and even Nigel Farage paid our wee country a visit this week! NOTE: This bunch have a flag on the literature but it is subtle. Robert Hill's face doesn't appear on the poster - I wonder why! Roisin Lynch is the S.D.L.P. candidate but I have no idea what she looks like or what she stands for. Her poster might have been removed overnight by the 7 unionist candidates because I haven't seen it. Also, I haven't had a flyer through my letterbox explaining her position on the important issues of the day. It's almost as if she realises she is beaten already and the S.D.L.P. can't be bothered spending the money to try to win my vote. I am genuinely amazed at how Sinn Fein have become the second largest party in Northern Ireland given their background and history. I know many nationalists who claim they would never vote for Sinn Fein in the same way that I know many unionists who claim they would never vote for the D.U.P. Yet these parties dominate at present. How odd! Must be the circles I move in! A united Ireland means the unity of the people of this island, including those who see themselves as British. That is why Irish governments must pursue every avenue to promote all-Ireland co-operation and to build relationships between all our people. This must include genuine efforts to outreach to the unionists on the basis of equality. Progress is certainly being made, but I feel anger rising every time I see any of them on the television. You see, you don't just see one of them... they are always flanked by at least half a dozen acolytes. Only "Third World Countries" behave in this manner. No other country has politicians who insist on this show of strength! Fundamentally, they still have a way to go to be able to reach out to me and, like the S.D.L.P., they aren't even attempting to do that where I live because there are no posters and no flyers. We have a Conservative candidate and he is called Mark Young. I have yet to see a poster or a flyer. I should applaud the Conservative Party for fielding a candidate. It's good to see the mainland parties taking an interest. I only know he is standing because I looked up the list of candidates on the BBC website. Otherwise, I would've been none the wiser! No poster; no flyer; no idea what he stands for. I can only base my voting preference for this guy based on what the Tories are doing at Westminster! Jim Ford, the leader of the Alliance Party, is standing in my constituency. For the past few years, he has acted as the Justice Minister at Stormont. I've always been keen on the idea of the Alliance Party mainly because they can set tribal politics to one side. However, they have disappointed me in recent times on some pretty big issues: Marriage Equality and the Abortion Law. As the Justice Minister, I would expect Jim Ford to press for modernisation of both and yet it seems to me that this just hasn't happened. At least there is no flag attached to the litereture! 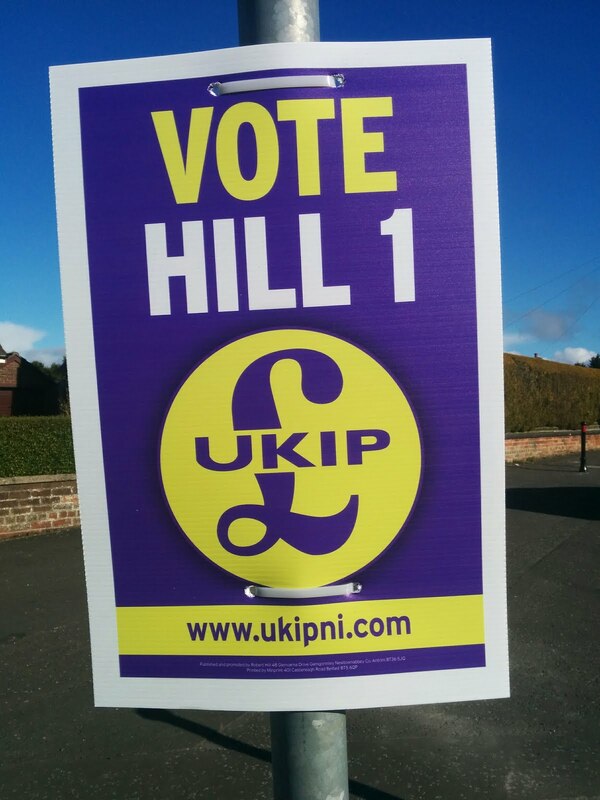 The Alliance Party do have the odd poster or two scattered about the constituency. It is hardly worth taking a photograph of it though given that it is a bright yellow poster with the words "Vote Alliance" on it. Slightly lacking imagination! I'm willing to set aside the finance issue somewhat. His claim that "many people have lost faith in the political system because of sectarianism" is 100% correct. Will those some people ditch their tribal instincts however? I hope so, but the "vote for us, in case the other lot get in" approach will likely work for some! Ah... the greens. Another party which has nothing to do with tribalism and on the vast majority of issues, I can't find fault. They are also fielding a female candidate (one of just three out of the thirteen I have to choose from) which has got to be applauded. I had to Google Helen Farley because I've had no literature (maybe because it is not eco-friendly) and have seen no posters (again, for ecological reasons at a guess?). She was moved to stand because she believes in "grassroots democracy and non-violence". She will also stand up to austerity and resist further cuts to our public service. She also wants to promote sustainable transport. There's no mention on how these things will be funded, but, so what... none of the parties are good at telling us how they will fund anything! That's a scary thing to tell a voter. On the big issues of today, the Greens seem to have got it right. Can they get the votes and bring about real change? When it comes to casting my vote, I found that there was not a single candidate I could vote for last time out so I did the "none of the above" thing. This time, however, there are 2 (maybe 3) that will get my proportional votes. How about you?